Calamity Jane: The Woman and the Legend – A Book Review Presented by Theresa Gardiner for the Coffee Cup Bunch of the Friends of the Library at the Altus Public Library Wednesday, February 6, 2019 10:00 AM to 11:00 AM The real Calamity Jane was someone the likes of whom you've never encountered. That is, until now. 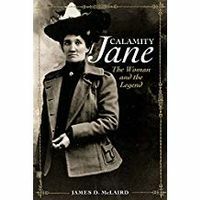 James D. McLaird’s book is a definitive biography of Martha Canary, the woman popularly known as Calamity Jane. It is a meticulously researched account of how an alcoholic prostitute was transformed into a Wild West heroine. A mother of two, she often found employment as waitress, laundress, or dance hall girl and was more likely to be wearing a dress than buckskin. But she was hard to ignore when she'd had a few drinks, and she exploited the aura of fame that dime novels created around her, even selling her autobiography and photos to tourists. Gun toting, swearing, hard drinking--Calamity Jane was all of these, to be sure. But whatever her flaws or foibles, the author paints a compelling portrait of an unconventional woman who more than once turned the tables on those who sought to condemn or patronize her. The event is free and open to the public. Refreshments will be served.